Obituary for Juliona "Julie" (Herzig) Behmer | Bermingham Funeral Home, Inc.
Ms. Juliona “Julie” Behmer (Herzig), age 74, passed away peacefully on Saturday August 18th, 2018 surrounded by family after a prolonged battle with cancer. Born and raised in Montclair, NJ she was predeceased in death by her parents, John Julius Herzig and Mary Elizabeth (Mae) Herzig and two brothers; Donald and Michael Herzig. 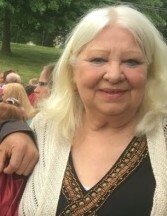 Julie is survived by her loving son, Jon Alan Behmer, beloved granddaughter Angelina, who she cherished dearly, sister Elizabeth “Betty Mae” Herzig, two brothers; Jon and Gregory Herzig and numerous loving cousins, nieces, and nephews and her pets Sammy and Star Baby (cats). Julie will be most remembered for her free spirit, kind heart, loving ways, love of the color purple, her Volkswagen Beetle, and her commitment to helping others. She remained a strong, brave woman even through her final months. In lieu of flowers, we ask that you celebrate Julie by donating to your local animal shelter. A memorial service will be held at a later date.